Short on time? Let solar-water-heater sellers contact you. 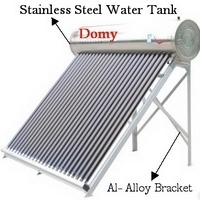 Solar heater for water of 179 liters - dct-470-47-150 usd $550.00 Brand diceno. Water container is suitable for 4 people. Outer tank is made of stainless steel; inner tank is made of aluminum with insulating polyurethane material. Measures of the tank are 1.80 meters of length x 46 cm of diameter. It contains 24 crystal tubes of 46 mm/1.50 meters. Fuse of entrance and exit is 1/2 " Weight of the equipment in operation is 574.20 pounds or (261 kg). Warranty is 5 years by manufacture defects.